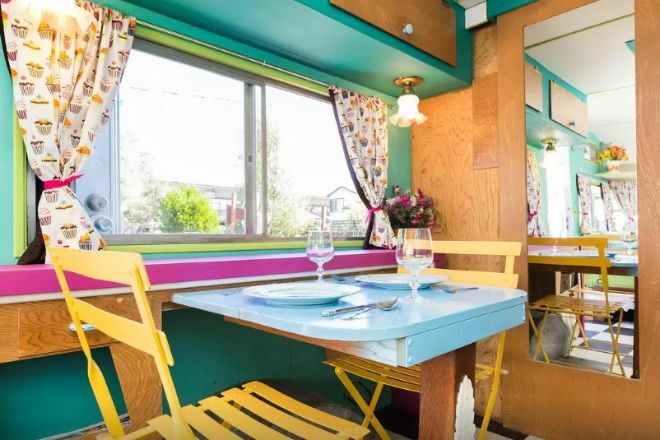 We normally talk about how light and bright spaces make these vintage renovated trailers really shine. Well, this is a major exception to that rule. 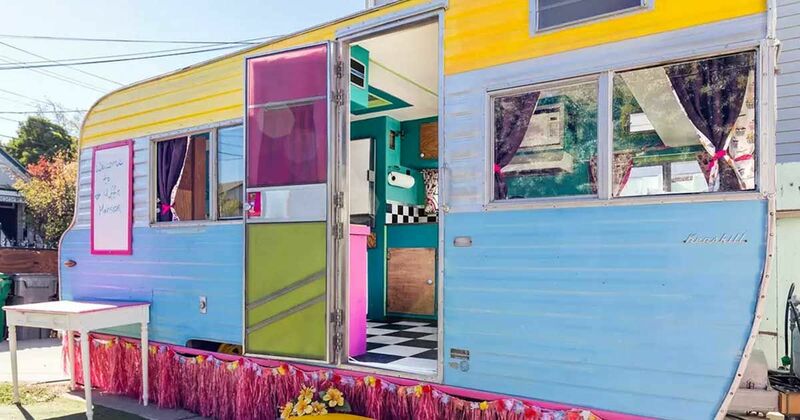 This incredibly colored and styled Kenskill trailer from the 1960s has gotten the makeover of a lifetime that plays on its vintage roots all while having some fun. Step inside and be transported to a technicolor world all its own. 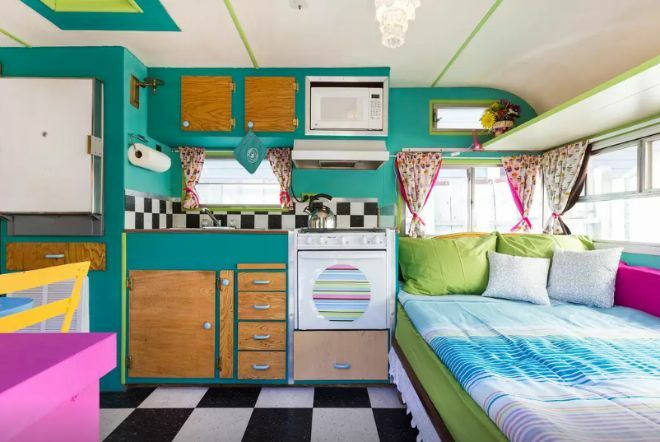 With turquoise walls, checkered tiles, and pink cabinets – you'll find yourself falling in love with color and the endless combinations in a whole new way. Best yet, you can stay here! 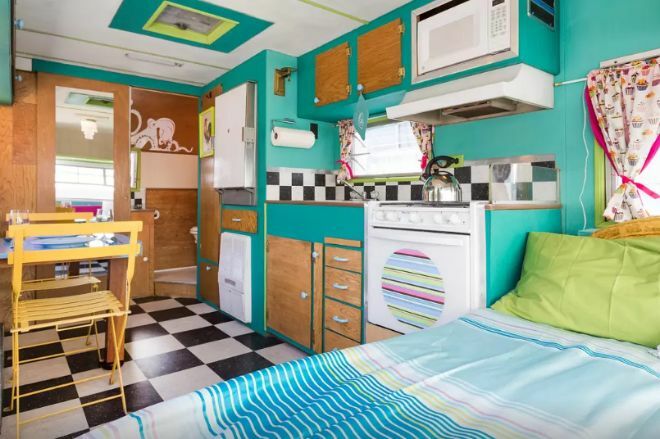 This trailer is up for rent on Airbnb in Oakland, Calif. 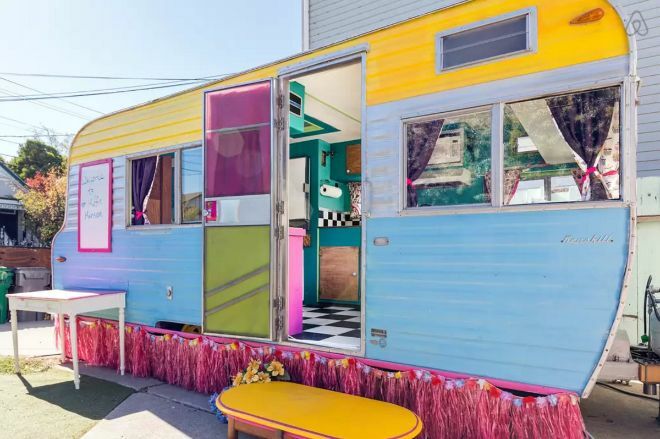 The color trip starts on the outside of this 1964 trailer. With blue, yellow, and even some pink fringe, you can tell this trailer is going to be a bunch of fun from a mile away. 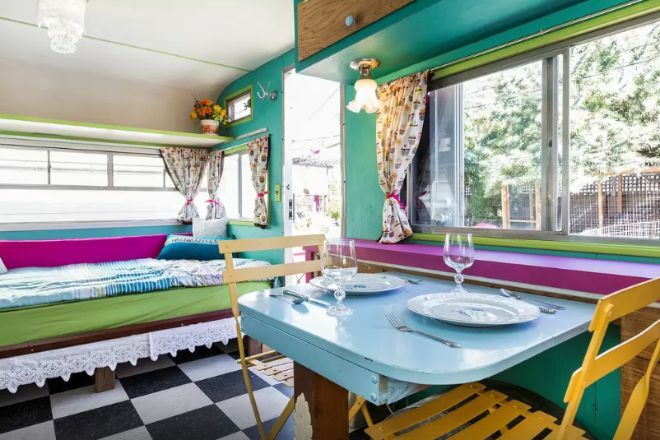 Stepping inside this renovated trailer takes you to a whole new world. We love how the cabinets have been painted to blend in with the wall, but that some still have their vintage wood faces. The golden cabinets really pop against that turquoise. The bed may be tucked in the corner, but it's a great size. And there's still plenty of room for a beautiful eating area and a full sized kitchen. 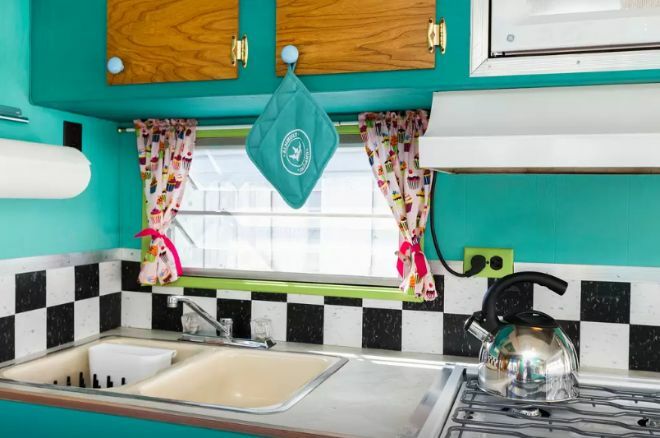 Still sporting some of its vintage parts – like the sink and stove – really brings that great 60s vibe to this trailer. We love the mix of modern and vintage – and of course how they're not afraid of color! This eating area is as cute as it gets. We love the bright yellow chairs, sky blue table, and those cupcake curtains. Everything in this space is both functional, and fun. Having the space be filled with so much color and patterns, you might think it makes it seem smaller – but that's not the case here at all. With such a small space to work with, all the color keeps your eye bouncing around and distracted from how little space there really is! SHARE this bold space and brighten up someone's day!